Written and directed by Ermanno Olmi, Il Posto is the story of a young man who travels to Milan from a nearby Italian suburb where he deals with his role working as a messenger for an Italian corporation unaware of his new surroundings and reality in the modern world. The film is an exploration into Italy’s post-war economic boom and it downsides as it relates to a young man from a rural background trying to find work only to deal with a reality that is unsettling and confusing. Starring Loredana Detto, Tullio Kezich, Sandro Panseri, and Mara Revel. Il Posto is a riveting and somber film from Ermanno Olmi. The film follows a young man who attends a job interview and exam hoping to get a viable position for this corporation in Milan that would help his working-class family only to be given a menial job as a messenger. It’s a film that play into a man’s search for work that would help him as well as give him a sense of importance as he also wants to do good for his family. Along the way, he meets a young woman who is also vying for a job that he wants as they bond in their search for work. Ermanno Olmi’s screenplay which featured contributions from art director Ettore Lombardi explore not just the difficult and baffling experience of job interviews for a corporation but also the sense of dehumanization in the corporate landscape. 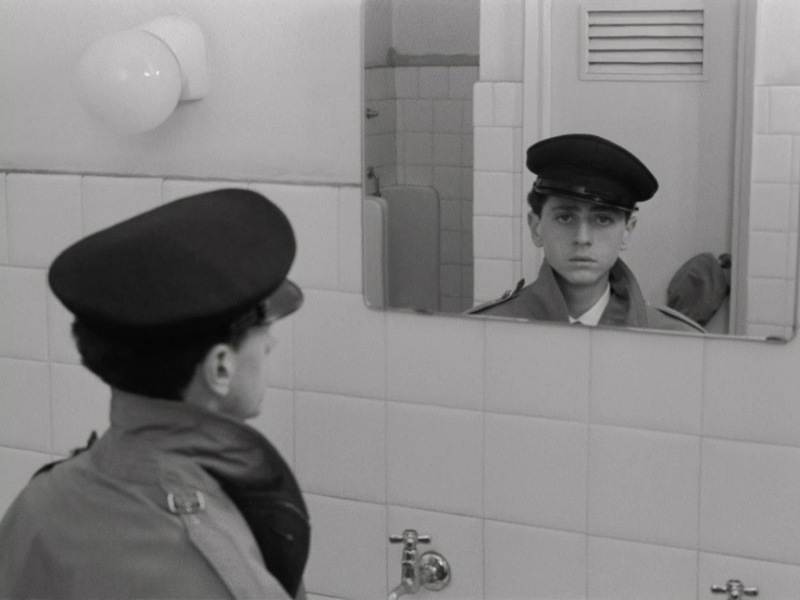 The film also has this odd structure that occurs in the film as it relates to the journey that Domenico (Sandro Panseri) endures where the first half is about him being interviewed for the job and the exams he has to take that involve his intelligence and skill but also physical and psychological tests with bizarre questions. During the first half of the film where Domenico would also meet Antoinetta (Loredana Detto) who is also trying to get work to help her family as they spend much of the day looking around the city of Milan as it’s this world that is starting to emerge as this epitome of modernism. Then the film’s second half has this shift in tone where Domenico gets his foot in the door in the hopes of being a clerk but he ends up being a messenger where he looks at this room full of clerks ranging from middle-aged to elderly. A glimpse into the lives of these characters is shown as it play into a future that Domenico might face. Olmi’s direction is evocative in the way he captures this air of modernism in Milan in the way it looks with buildings being built as if a new world is emerging from this post-war economic boom. Shot on location in Milan as well as areas nearby, Olmi does present this other location as a world that is dirty and grimy where it’s not as developed from the years after World War II in comparison to the spacious yet exhilarating world of Milan. Olmi would use wide shots of these locations that play into Domenico’s own sense of alienation and confusion of his surroundings that include crowded cafes and shops where everything is expensive. Olmi would use the wide and medium shots to play into this disconnect of individualism and loneliness within the corporate world as he would emphasize on the latter for the scenes in the second half where these clerks are working where it feels oppressive and claustrophobic. Even as there is this sequence that glimpse the lives of these individuals who work hard but are oppressed with one of them aspiring to write as an outlet for his oppression. Olmi’s usage of close-ups play into Domenico’s own confusion as well as a sadness into this world he’s about to venture into. Yet, there are these lively moments such as a scene in the third act during a New Year’s Eve party that Domenico would attend hoping to meet Antoinetta who got another job in the same corporation. It would be a moment where despite the prospect of becoming a clerk and maintaining his work as a messenger, there is still so much he can experience. That is then followed by this ending that does play into Domenico’s future as well as what he will endure if he does succeed in being a clerk for this corporation where he’s just another peg in a world that is indifferent to individualism or human emotion. Overall, Olmi crafts a rapturous and eerie film about a young man dealing with the expectations in a corporate environment in Milan. Cinematographer Lamberto Caimi does brilliant work with the film’s black-and-white cinematography as it play into look of Milan in all of its vibrancy in day and night as well as the way the office is lit including the desk of one clerk. Editor Carla Colombo does excellent work with the editing as it filled with stylish cuts as well as play into the drama with the jump cuts including the sequence of the clerks in their personal lives. Art director Ettore Lombardi does amazing work with the look of the offices as well as the home Domenico lives with his family. The sound work of Giuseppe Donato is terrific for creating that sparse atmosphere at Domenico’s home and at the offices including the clerks’ office room with a more raucous sound for the scene at the cafe. The film’s music by Pier Emilio Bassi is wonderful for its music score that is largely a brass music piece that appears in the film’s opening credits and in another scene while much of the music soundtrack features some vibrant dancehall music that is played at the New Year’s Eve party scene. The film’s superb cast feature a couple of small roles from Mara Revel as an older colleague that Domenico would work for and Tullio Kezich as a psychologist asking Domenico strange questions. Loredana Detto is incredible as Antoinetta as a young woman who is seeking to find a job at the same corporation that Domenico is seeking at as she would get work at a different place which only lead to this growing de-humanization process in the corporate world. Finally, there’s Sandro Panseri in a phenomenal performance as Domenico as a young man from a nearby suburb of Milan who travels to the city to get a job hoping he would work hard and rise up to help himself and his family only to see where he has started and the oppressive environment he would encounter. Il Posto is a tremendous film from Ermanno Olmi. Featuring a great cast, gorgeous visuals, and haunting themes on modernism and the loss of individualism in the corporate world. It’s a film that showcases a young man entering into a world that is cruel and oppressive as he copes with the role he has to play. In the end, Il Posto is a sensational film from Ermanno Olmi.